It measures 40 billion km across - three million times the size of the Earth - and has been described by scientists as "a monster". "What we see is larger than the size of our entire Solar System," he said. "It has a mass 6.5 billion times that of the Sun. And it is one of the heaviest black holes that we think exists. It is an absolute monster, the heavyweight champion of black holes in the Universe." 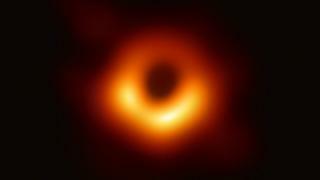 Media captionProf Heino Falcke: "We still have to understand how the light is generated"
The image shows an intensely bright "ring of fire", as Prof Falcke describes it, surrounding a perfectly circular dark hole. The bright halo is caused by superheated gas falling into the hole. The light is brighter than all the billions of other stars in the galaxy combined - which is why it can be seen at such distance from Earth. The image matches what theoretical physicists and indeed, Hollywood directors, imagined black holes would look like, according to Dr Ziri Younsi, of University College London - who is part of the EHT collaboration. "Although they are relatively simple objects, black holes raise some of the most complex questions about the nature of space and time, and ultimately of our existence," he said. "It is remarkable that the image we observe is so similar to that which we obtain from our theoretical calculations. So far, it looks like Einstein is correct once again." But having the first image will enable researchers to learn more about these mysterious objects. They will be keen to look out for ways in which the black hole departs from what's expected in physics. No-one really knows how the bright ring around the hole is created. Even more intriguing is the question of what happens when an object falls into a black hole. It is an investment that has been vindicated with the publication of the image. Prof Falcke told me that he felt that "it's mission accomplished". He said: "It has been a long journey, but this is what I wanted to see with my own eyes. I wanted to know is this real?" Image caption Katie Bouman is the MIT student who developed the algorithm that pieced together the data from the EHT. Without her contribution the project would not have been possible. The information they gathered was too much to be sent across the internet. Instead, the data was stored on hundreds of hard drives that were flown to central processing centres in Boston, US, and Bonn, Germany, to assemble the information. Katie Bouman a PhD student at MIT developed an algorithm that pieced together the data from the EHT. Without her contribution the project would not have been possible. Prof Doeleman described the achievement as "an extraordinary scientific feat". "We have achieved something presumed to be impossible just a generation ago," he said. "Breakthroughs in technology, connections between the world's best radio observatories, and innovative algorithms all came together to open an entirely new window on black holes." Odd though it may sound, that is harder than getting an image from a distant galaxy 55 million light-years away. This is because, for some unknown reason, the "ring of fire" around the black hole at the heart of the Milky Way is smaller and dimmer. 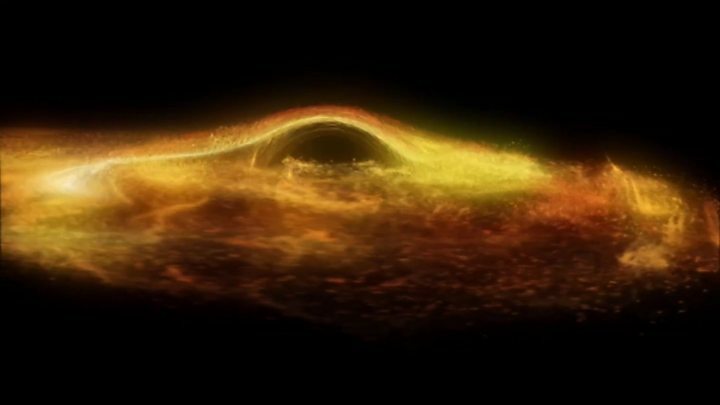 How to see a Black Hole: The Universe's Greatest Mystery can be seen the UK at 21:00 on BBC Four on Wednesday 10 April.